As much as I've tried to avoid using brand names, so you the artist can experiment and find what you like, it is unavoidable with software. I still encourage you to do the same with software and try them all to see what you like by using demo versions which usually last 30 days. Some demo versions are full and let you use all the tools while others are crippled and you cannot access some tools, can't save or only save with a watermark. No matter; try a demo before you buy any software. The Adobe suite of products is the beast that can't be avoided and is the expensive poison of choice for the creative, advertising, entertainment, print and comic book industry. So while it it is expensive, there's no way to avoid having Adobe software in your tool set. If you are a teacher or student you can get an education discount which is really great. It's not like the Apple educational discount on their computers which is a measly $50 approximately. There are two types of digital imaging. 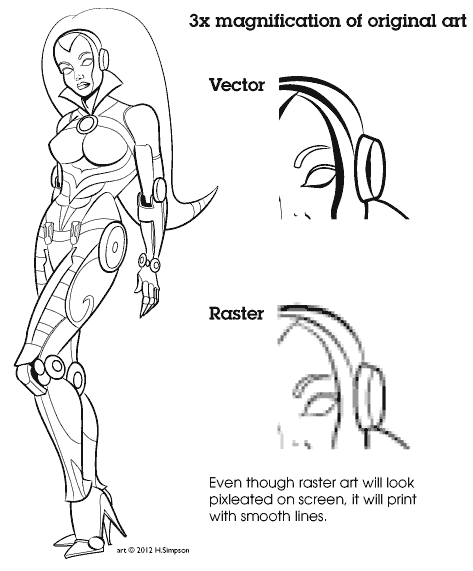 RASTER - A paint program. A rectangular array of closely spaced rows of pixels that form an image by defining values. It is resolution dependent. When you scale up rasterized/bitmap art there is an immediate loss in quality. VECTOR - A draw program. Mathematical expressions of points, lines, curves and shapes to represent images. A growable array of objects called control points which have a definite position on the x and y axes. The size of a vector can grow and shrink with no loss in quality. 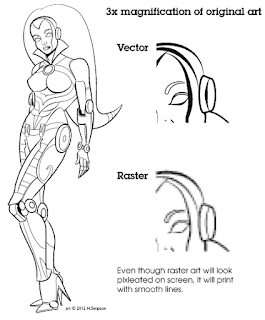 Vector graphics require less memory than raster images. Next time we'll look at the actual software applications you can use to create that popular form of entertainment known as comic books. read next - What's our Vector, Victor?